Charles Jefferies (1849-1920), was editor of the young peoples’ magazine The Friendly Companion from 1882 to 1919. Jefferies was born in Malmesbury. An account by Jefferies of his own religious experiences was published after his death in The Friendly Companion, but this included few details of his life. Census returns show that in 1851, aged 2, he was living as a ‘lodger’ with the family of an agricultural labourer George Barnes in Westport, Malmesbury. In 1861, aged 12, he was living with his grandparents and working as an errand boy. His grandfather Henry Jefferies was a maltster aged 52. Jefferies gave ‘little bits of help’ to The Friendly Companion from an early stage. From June 1880 to June 1881, Grey Hazelrigg was the editor of The Friendly Companion. But by December 1881 it appeared that either Charles Jefferies should edit it, or the magazine must close. Jefferies consented to work for three months until another editor could be found – but he remained as editor until shortly before his death. His work for the magazine and for the Gospel Standard Societies left him little leisure time; he accepted £12 for the work, and 10 shillings to cover expenses. Clara, who always supported his work, died in January 1914. Jefferies included letters from soldiers in the magazine during the First World War and commented on war news. His Pastor, Mr. S. Pack particularly remembered one of his prayers at a special prayer meeting held during the War. Pack found Jefferies a ‘kind and true friend, one deeply concerned about the welfare of Zion, also of our beloved country.’ For the last few years of his life, Jefferies was a deacon of Hanover chapel in Tunbridge Wells. He suffered a severe illness in January 1919 and did not regain his strength; he died on 30th July 1920. Census returns 1851, 1861, 1891, 1911. The Friendly Companion 1914, pp. 74-80, 98-104. Obituary of Clara Jefferies, with details of how Jefferies came to be editor of the magazine. The Friendly Companion 1920, pp. 201-211, 221-232. 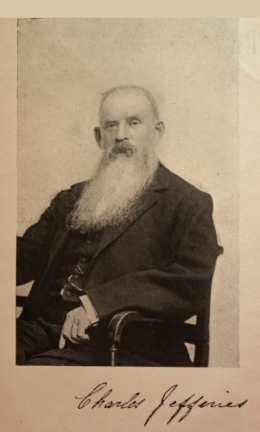 Portrait as frontispiece of the bound volume of the 1920 magazine.